Windows 8.1 is available to everyone starting today, October 19. The latest version of Windows improves on Windows 8 in every way. It’s a big upgrade, whether you use the desktop or new touch-optimized interface. The latest version of Windows has been dubbed “an apology” by some — it’s definitely more at home on a desktop PC than Windows 8 was. However, it also offers a more fleshed out and mature tablet experience. For Windows 8 users, Windows 8.1 is completely free. It will be available as a download from the Windows Store — that’s the “Store” app in the Modern, tiled interface. Assuming upgrading to the final version will be just like upgrading to the preview version, you’ll likely see a “Get Windows 8.1″ pop-up that will take you to the Windows Store and guide you through the download process. You’ll also be able to download ISO images of Windows 8.1, so you can perform a clean install to upgrade. On any new computer, you can just install Windows 8.1 without going through Windows 8. New computers will start to ship with Windows 8.1 and boxed copies of Windows 8 will be replaced by boxed copies of Windows 8.1. If you’re using Windows 7 or a previous version of Windows, the update won’t be free. Getting Windows 8.1 will cost you the same amount as a full copy of Windows 8 — $120 for the standard version. If you’re an average Windows 7 user, you’re likely better off waiting until you buy a new PC with Windows 8.1 included rather than spend this amount of money to upgrade. Some have dubbed Windows 8.1 “an apology” from Microsoft, although you certainly won’t see Microsoft referring to it this way. Either way, Steven Sinofsky, who presided over Windows 8′s development, left the company shortly after Windows 8 was released. Coincidentally, Windows 8.1 contains many features that Steven Sinofsky and Microsoft refused to implement the first time. Boot to Desktop: You can now log in directly to the desktop, skipping the tiled interface entirely. Disable Top-Left and Top-Right Hot Corners: The app switcher and charms bar won’t appear when you move your mouse to the top-left or top-right corners of the screen if you enable this option. No more intrusions into the desktop. The Start Button Returns: Windows 8.1 brings back an always-present Start button on the desktop taskbar, dramatically improving discoverability for new Windows 8 users and providing a bigger mouse target for remote desktops and virtual machines. Crucially, the Start menu isn’t back — clicking this button will open the full-screen Modern interface. Start menu replacements will continue to function on Windows 8.1, offering more traditional Start menus. Show All Apps By Default: Luckily, you can hide the Start screen and its tiles almost entirely. Windows 8.1 can be configured to show a full-screen list of all your installed apps when you click the Start button, with desktop apps prioritized. 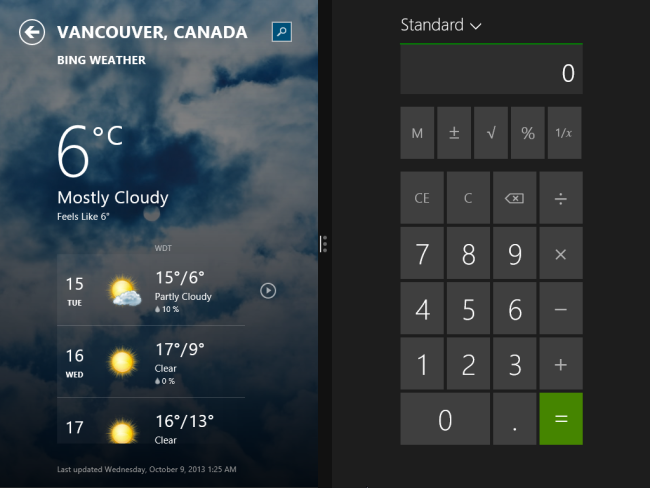 The only real difference is that the Start menu is now a full-screen interface. Shut Down or Restart From Start Button: You can now right-click the Start button to access Shut down, Restart, and other power options in just as many clicks as you could on Windows 7. Shared Start Screen and Desktop Backgrounds; Windows 8 limited you to just a few Steven Sinofsky-approved background images for your Start screen, but Windows 8.1 allows you to use your desktop background on the Start screen. 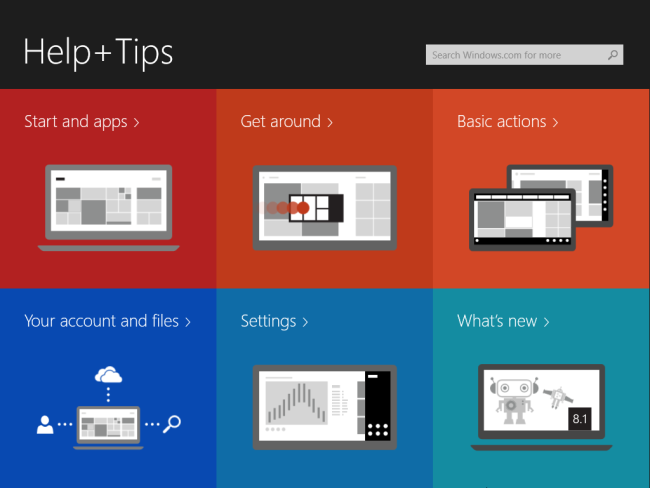 This can make the transition between the Start screen and desktop much less jarring. The tiles or shortcuts appear to be floating above the desktop rather than off in their own separate universe. 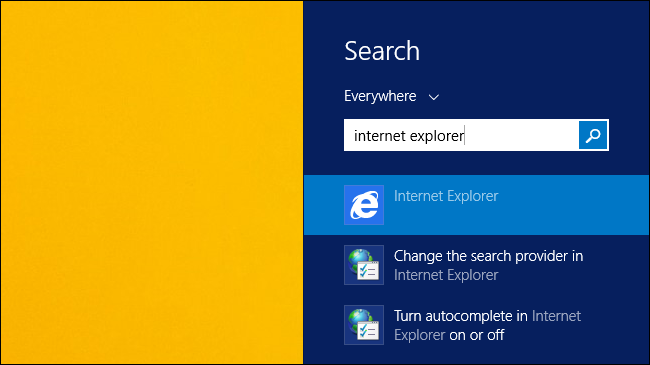 Unified Search: Unified search is back, so you can start typing and search your programs, settings, and files all at once — no more awkwardly clicking between different categories when trying to open a Control Panel screen or search for a file. These all add up to a big improvement when using Windows 8.1 on the desktop. Microsoft is being much more flexible — the Start menu is full screen, but Microsoft has relented on so many other things and you’d never have to see a tile if you didn’t want to. These are just the improvements specifically for desktop users. Windows 8.1 includes other useful features for everyone, such as deep SkyDrive integration that allows you to store your files in the cloud without installing any additional sync programs. If you have a Windows 8 or Windows RT tablet or another touch-based device that you use the interface formerly known as Metro on, you’ll see many other noticeable improvements. Windows 8′s new interface was half-baked when it launched, but it’s now much more capable and mature. App Updates: Windows 8′s included apps were extremely limited in many cases. For example, Internet Explorer 10 could only display ten tabs at a time and the Mail app was a barren experience devoid of features. In Windows 8.1, some apps — like Xbox Music — have been redesigned from scratch. Internet Explorer allows you to display a tab bar on-screen all the time, while apps like Mail have accumulated quite a few useful features. The Windows Store app has been entirely redesigned and is less awkward to browse. Snap Improvements: Windows 8′s Snap feature was a toy, allowing you to snap one app to a small sidebar at one side of your screen while another app consumed most of your screen. Windows 8.1 allows you to snap two apps side-by-side, seeing each app’s full interface at once. On larger displays, you can even snap three or four apps at once. Windows 8′s ability to use multiple apps at once on a tablet is compelling and unmatched by iPads and Android tablets. You can also snap two of the same apps side-by-side — to view two web pages at once, for example. More Comprehensive PC Settings: Windows 8.1 offers a more comprehensive PC settings app, allowing you to change most system settings in a touch-optimized interface. You shouldn’t have to use the desktop Control Panel on a tablet anymore — or at least not as often. Touch-Optimized File Browsing: Microsoft’s SkyDrive app allows you to browse files on your local PC, finally offering a built-in, touch-optimized way to manage files without using the desktop. Help & Tips: Windows 8.1 includes a Help+Tips app that will help guide new users through its new interface, something Microsoft stubbornly refused to add during development. There’s still no “Modern” version of Microsoft Office apps (aside from OneNote), so you’ll still have to head to the desktop to use Office apps on tablets. It’s not perfect, but the Modern interface doesn’t feel anywhere near as immature anymore.